If you have mild hand tremors this bowl is easy to hold with one hand. It can get a little too warm if you put in very hot soup, so be careful the first few times you use it. The smooth interior means it is easy to clean. 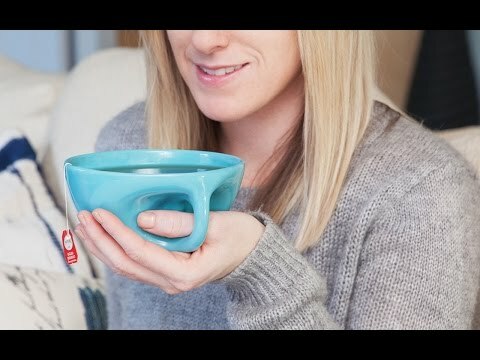 This ingenious bowl fits perfectly and comfortably in one hand and is actually pretty deep. Ordered a second one because hubby commandeered the first - says it's a great big boy cereal bowl. These bowls are fantastic. So easy to hold. 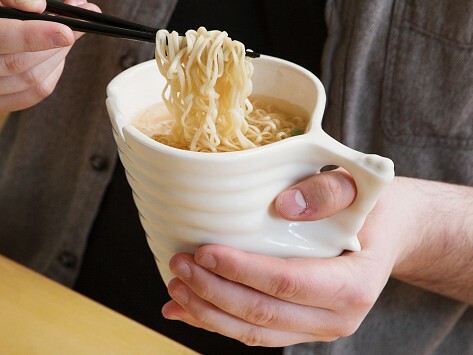 I use them for more than just a noodle bowl. Am giving one as a gift to someone with severe arthritis in hands. As someone who never eats at a table and has a problem with shaky, painful hands... This is a huge help. I use it for both food and drinks, and just love them. These wonderful bowls have been on back-order since Christmas 2018. They still are! I wish the supplier would hurry up and supply Gommet with more inventory. Thanks you! Nice but not as advertised. No chop sticks come with the bowl ! When I asked about it, I was told that even though the advertising and the box say they are included, heck, even this request for a review had a picture showing chop sticks, I was told they are not included and they are working on removing that statement from the box. Otherwise it is a very nice gift and a handy soup and ramin item. My daughter has plenty of chop sticks!